The children weren’t attending, but their faces were in signage everywhere. Over the last few months, I’ve offered benefit auction ideas on managing your gala in a bad economy. You can use all kinds of techniques to ensure your revenues remain strong in a recession, but one solid strategy of raising money – regardless of economic winds – is to show guests how their donation impacts others. In this case, children. Children (and animals, to a large degree) seem to have universal appeal which you can tap into. Many organizations benefit kids in one way, shape, or fashion, so if you have an angle that you can incorporate into your event, consider doing so. Even when the kids aren’t attending, you can still successfully incorporate them into the plan. 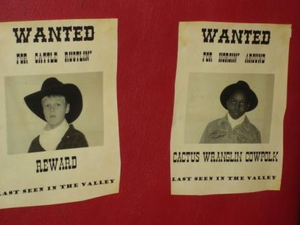 At a school auction with a western theme, “WANTED” posters showcased the children. They were everywhere! The most common way to showcase how your organization is helping children is to incorporate photos of the children into displays. Those might be on foam core displays or in something more multi-dimensional, like what I saw at a homeless shelter. Plus side: Easy to do. Signs are reusable for other events. If your gala has a theme, one way to make the signage stand out is to create a visually appealing display around it. For instance,a school auction with a western theme had several temporary walls et up around the silent auction and registration areas. The walls had the children’s photos on them, with each child photographed in western gear. Because it was clever, many guests visited all of the walls (not just the ones with their child on it) to admire the creativity of the project. Plus side: Adds to the decor. Helps reinforce the “why are we raising money” message. Negative side: Takes more upfront time to create the individual shots. 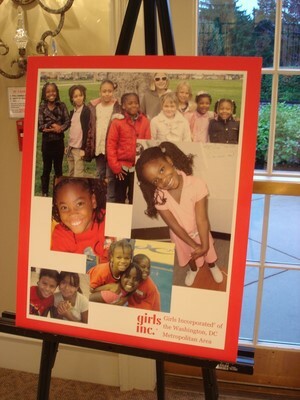 Read Part 2, Benefit Auction Ideas Using Kids. We’re a very small start-up on raising funds for our Reading Caravan (we launched in November at “Reading Festival” and many attended… but we’d like to try another approach and program with regards to our literacy program among impoverished kids in our area. Your tip is well-taken, thanks! Sounds like a great cause, Marge. (Many years ago now, I volunteered for Literacy Volunteers of America to help an adult learn to read.) Good luck with your new approach.